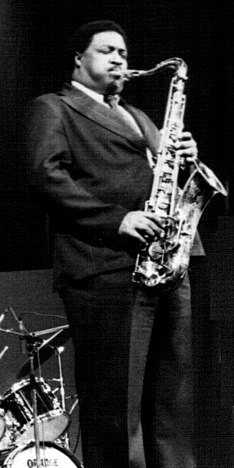 Houston Person (born November 10, 1934) is an American jazz tenor saxophonist and record producer. Although he has performed in the hard bop and swing genres, he is most experienced in and best known for his work in soul jazz. He received the Eubie Blake Jazz Award in 1982. Person grew up in Florence, South Carolina, and first played piano before switching to tenor saxophone. He studied at South Carolina State College where he was inducted into the school's Hall of Fame in 1999. In the United States Air Force, he joined a service band stationed in West Germany, and played with Don Ellis, Eddie Harris, Cedar Walton, and Leo Wright. He later continued his studies at Hartt College of Music in Hartford, Connecticut. He first became known for a series of albums for Prestige in the 1960s. Contrary to popular belief, he was never married to the vocalist Etta Jones, but did spend many years as her musical partner, recording, performing and touring, and for much of his career this association was what he was best known for. They first met playing in organist Johnny Hammond's band. There are more than 75 albums recorded by Houston Person as a bandleader, on Prestige, Westbound, Mercury, Savoy, and Muse, and he has most recently been recording on HighNote. He has recorded with Charles Brown, Ron Carter, Bill Charlap, Charles Earland, Lena Horne, Etta Jones, Lou Rawls, Janis Siegel, Horace Silver, Dakota Staton, Cedar Walton, plus Billy Butler, Don Patterson, Grant Green, Sonny Phillips, Johnny "Hammond" Smith, Richard "Groove" Holmes and others. Person has been a resident of Newark, New Jersey. Houston Person performing with his combo at the Red Bank Jazz & Blues Festival in 2009. ^ "The State of Jazz: Meet 40 More Jersey Greats", The Star-Ledger, September 28, 2003, backed up by the Internet Archive as of September 27, 2008. Accessed September 15, 2017. "Houston Person -- Deep-toned, blues-rich tenor saxophonist Person, who lives in Newark, has performed and/or recorded with Johnny Hammond, Cedar Walton and Charles Earland, among many others." ^ Houston Person, Remember Love. Review by Alex Henderson, NYCJR, September 2018 - Issue 197, page 16. Retrieved September 5, 2018. This page was last edited on 12 February 2019, at 06:11 (UTC).